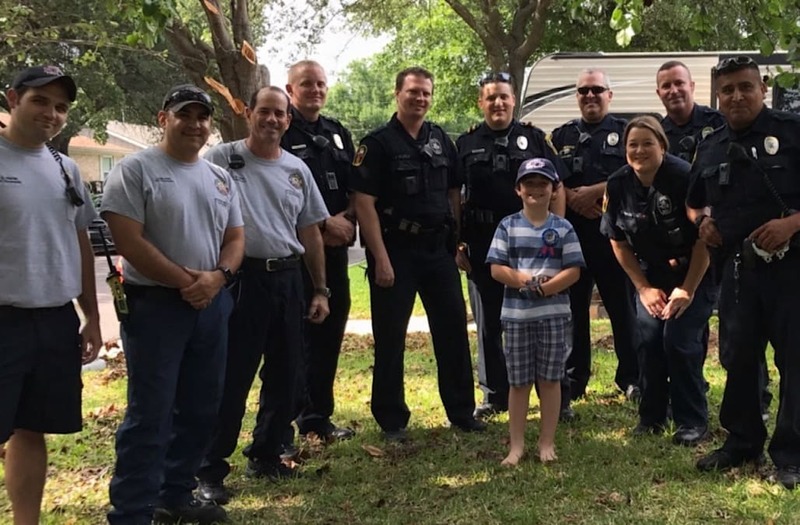 An 8-year-old Texas boy had the birthday party of his life when a troop of police officers and firefighters celebrated with him over pizza and cake, after no one else showed up. "We threw up our lights, hit the sirens a few times, and [Graham] started running across the driveway, stopped on the grass, and he was just in shock at that point," Lieutenant Mark Schwobel of the Hurst Police Department told InsideEdition.com. "He was showing us his Nerf guns. He looked like he was having a heyday with all the extra company and attention there." Schwobel explained he rallied his entire team to come out to Graham Day's 8th birthday party when the boy's mom, Jennifer Day, told the department no one had shown up at her son's celebration. "Graham was just so broken down [when his friends didn't come], but now that everybody's come, he's come so far out of his shell," his mom Jennifer Day told InsideEdition.com. "Maybe this has been more than just a small birthday thing. This might have healed a piece of him." Day explained this wasn't the first time no one showed up at her Graham's birthday. When Graham was turning 6 years old, Day said she sent out invitations, but none of the 19 kids that received invitations came. She said she believes her younger son, Charlton, who is nonverbal and has autism, is what drove the other kids away. "His younger brother is not always the easiest to get around. He'd be unmanageable sometimes, having some meltdowns, and some days were worse than others," Day explained, through tears. "There's awareness for a child that has autism. What nobody seems to understand is that the normal siblings suffer terribly because of it." So, when Graham realized he would be alone on his birthday again this year, Day could see the disappointment. "He just says, 'This always happens,' his mom said. "He was just this broken little boy." And that was when she decided to do something about it. "I just snapped," Day said. "This is not okay, this is not happening. I can fix this and I've got to try." After posting to social media, pleading for her friends to bring their kids to the party, she said she and her husband marched to their local police station, hoping they would spare an officer for a boy who dreams of one day becoming a cop. Instead, Schwobel volunteered his entire team, and even got the support of some of his firefighter friends. "We're pretty much willing to do just about everything," Schwobel told InsideEdition.com. "That's what the job entails. We just want to help the community [...] especially a young kid [who had] nobody show up at his birthday party. A lot of people don't think we have hearts, but we're people too."